Irritable bowel syndrome or IBS is a disease which is characterized by abdominal cramping, pain, gas, constipation followed by diarrhea and bloating. Who Does Irritable Bowel Syndrome Affect Most Often? IBS causes a person to suffer a great deal of discomfort which can range from mild, moderate or severe, but it does not cause permanent intestinal damage or lead to any serious diseases. With careful dietary modification, stress management and possibly prescription medications, a person can usually control the most uncomfortable aspects of IBS, but for some it can be debilitating. Irritable bowel syndrome is one of the most common of all gastrointestinal issues worldwide. In the United States, approximately 10-15% of the population experiences the disorder, with most people having only mild symptoms. Not all people with IBS seek medical attention, but in between 2.4-3.5 million people visit the doctor each year for the disorder. The costs of IBS to society in terms of medical expenditures and indirect costs are an estimated $21 billion per year, with loss of productivity in the workplace being the most expensive. A significant number of people experiencing IBS are female, but males also experience 35-40% of all cases of the disorder. 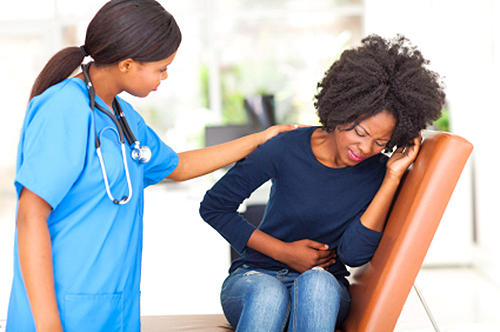 IBS is a major women’s health issue and because of the condition, a female has a higher risk of abdominal surgery for things like a hysterectomy or an ovarian problem. Statistics show that surgeries are 47-55% higher in women with IBS, than in other comparison groups. Food: chocolate, milk, alcohol, fruits, vegetables and carbonated beverages could inflame the intestines and result in a person having an IBS attack. Stress: changes to daily routine, loss of a family member or other external stressors could lead to an increased risk of developing an episode of IBS. Hormones: hormonal changes could also play a role in the development of IBS and many females find the symptoms increase around the time of the menstrual cycle. Other illnesses: ulcerative colitis, Crohn’s disease, infectious diarrhea and many other illnesses could trigger an IBS attack. Each year since 1977, the International Foundation for Functional Gastrointestinal Disorder has designated April as IBS Awareness Month. During the month, the foundation focuses attention on IBS diagnosis, treatment and management of symptoms. Health care professionals, community groups and educators use these special awareness campaigns to promote the cause and raise awareness, hoping to improve understanding of the disorder and improve quality of life for those that have the condition. While irritable bowel syndrome can be a very uncomfortable and even debilitating disorder, there are ways of treating and managing the symptoms which can make life better for some people. With certain lifestyle and dietary accommodations and prescription medications, a person has many options available when considering how to approach the disorder. When dealing with a disorder like IBS, it is best a person consults with a gastroenterologist to find out effective ways of living the best quality of life possible while keeping the problems and side effects under control effectively. What has cured your IBS? Intestinal congestion managed successfully by reflexology? What is better for diarrhea - Amodium AD or Kaopectate?